I don't know if you can beat the original. This authoritative book, by Isabel Briggs Myers and Peter B. Myers, introduced MBTI to the masses in 1980. 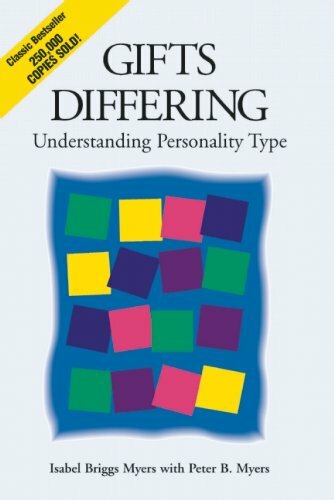 I would strongly recommend it to anyone interested in personality type. The book starts off by introducing MBTI and the preferences. It delves briefly into how MBTI is an extension of Jung's theory. After that, it provides some interesting statistics on type preferences in the general population and how it relates to the the frequency of certain characteristics. Ever wonder what the distribution of types is among national merit finalists, science students, or liberal arts students? You'll find out here. What I most like about Gifts Differing is that it lays out the system in a clear and concise way and then delves into practical applications of the system - such as the effect of the SN or TF preferences. There are chapters on learning styles, typical occupations, good type development and even motivation for type development in children. One unique aspect of the book is that it groups the profiles by dominant cognitive function. So for example ESTJs and ENTJs (both dominant extraverted thinking) are described in the same profile but with sections that explain the differences between the two types. I enjoyed this book a lot. I thought her approach to figuring out type was a bit different and interesting. My only disappointment is that the sections describing each of the 16 types is very brief. I don't know if you can beat the original. This authoritative book, by Isabel Briggs Myers and Peter B. Myers, introduced MBTI to the masses in 1980. I would strongly recommend it to anyone interested in personality type. Exactly. One reason I like this book is that it provides more background information than other books do about how and why the MBTI system originated. I always recommend people interested in the topic read this book first, and have given several copies away as gifts. One thing I liked was the idea that people have similarities across types. All Is share some things, just like all Ns and all Ts and all Ps. And the more letters we share, the more we have in common, so a ENFP and a ENFJ will have a lot of similarities. I know officially the MBTI folks don't use JCF, but she even nods to it as well. Putting that together, IME, a ENFP and a ENFJ can often arrive at the same destination, but they actually travel very different paths to get there. So, sharing ENF does mean something. "Understand the MBTI and practice it" (esf editors). Is fed from subjective and unconscious roots—archetypes. For example, some readers, who would like to get to the practical applications of this theory, are looking at it from the extravert standpoint. Other readers, who feel more interest in the insight that the theory may provide for understanding themselves and human nature in general, are seeing it from the introvert point of view. Overall the book is not as precise as I hoped it would be. I appreciate this book a lot and I have found it's a good resource - especially in academic writing. I voted 4 stars only because something has to really wow be to be a 5 star book. I'd recommend this to a beginner or an enthusiast and I find that it's pretty accessible, well organized, and provides enough information about the standard system that it is valuable no matter what level of interest one has. This is pretty interesting. I always thought elementary school teachers were ISFJ and ESFJ. NTs are rare for teaching little children. The chapters describing each type were too short. Mourning & Personality Type: how different types go trough it. On art appreciation: How different personality types behave and interact with art? [MBTItm] Different home/work personality types?